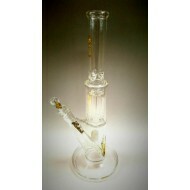 The Medicali Hammer Style Medium Bubbler has a reinforced, 4 slit stem for maximum Perculation. ..
Medicali Medium Hammer Style Bubbler. Sweet, simple and straight to the point with these Medicali tubes. 10' tall 3' base. Bas..
Water Pipe by Medicali. 10" Straight Tube with Assorted Labels. The Medicali Slime Micro 8Tree ST has a unique variety of colors and percolators. This Sl..
Water Pipe by Medicali. 10" 8 Tree Perc Straight Tube. Medicali 2 Chamber Water Pipe with asst labels. 14 " Diffused stem. 14 mm. 8 arm tree pe..